The previous plan for this long-discussed eight-mile path — to run it alongside the Portland & Western rail line — died in February 2015. The county planning commission shot it down after farmers objected that it would hamper their operations. The rail line option is off the table now, and the county commissioners have to decide whether to keep the concept alive by trying another route. Public Works Director Josh Wheeler told the crowd of close to 100 that the county has no interest in routing the pathway where it would conflict with neighbors. The county last year commissioned a survey that showed the bikeway had considerable public support and would be used mainly for recreation and to a much smaller extent for commuting. Consultants since then talked to “stakeholders” about potential routes. Tuesday’s forum was the last item in phase 1 of what may be a three-phase planning process. Whether the county goes to phase 2 is to be decided when the three-member board of commissioners meets on Tuesday (Dec. 20). 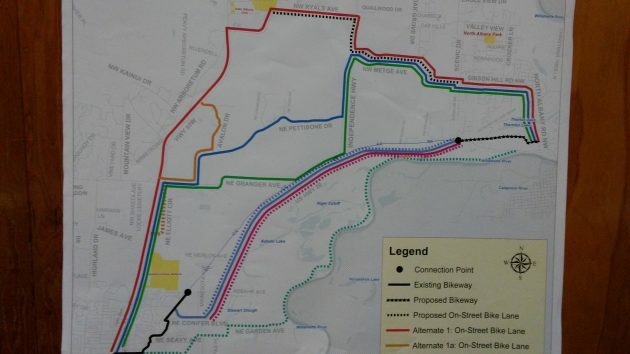 A map at the meeting showed eight routes theoretically possible, but most don’t appear practical (at least to me). 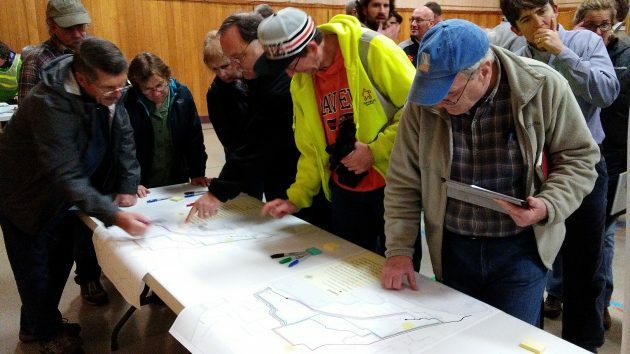 The longest would take users from Albany to Corvallis via bike lanes on North Albany Road, Gibson Hill Road, Oak Grove Drive, Metke Lane, Independence Road, Ryals Avenue, and finally Highway 99W. Several other alternatives also assume bike lanes on secondary roads criss-crossing the countryside between the two cities. The map showed one theoretical alternative along the winding left bank of the Willamette River. I heard several people dismiss it as unfeasible because it would cross wetlands and farmland, require bridges, and would be unusable in winter as the river comes up. Among the seemingly most practical alternatives were either bike lanes on Highway 20 itself or a separate path paralleling the highway. Wheeler, though, stressed that the choice of a route was still wide open, and the audience was invited to suggest other possibilities on maps that were provided. Determining whether there’s a viable route will happen in Phase 2 if the commissioners go ahead and direct consultants to keep working. In order to be studied further, a route would have to meet criteria such as compatibility with surrounding land uses, and feasibility in terms of engineering and cost. It would also have to be environmentally acceptable, help reduce congestion, and be safe for users and neighbors. Wheeler cautioned that it’s entirely possible no feasible route will be identified. Dozens of participants filled out comment cards. I read a few of them. Why a second path, one of them asked, when ODOT had already built one along Highway 34 to Riverside Drive? Another said the writer would like a direct path to Albany so she could bike to and from the Amtrak station. A third said climate change should be part of the consideration. These are some of the alternatives, including a route along the Willamette River. Studying the map of potential bikeway route alternatives. The many ways the public can take part in the bikeway planning. Thanks again for your continuing coverage of this story. It was great to see the public interest from the many sides of this issue. I was impressed at the variety of options put forth on the brainstorming maps, and the different issues being documented during the open portion of the meeting. Whether there is a possible path or not, I’m glad we are taking the time (and spending the money) to really look into the issue. Examining how Corvallis and Benton County deal with public issues is notable. 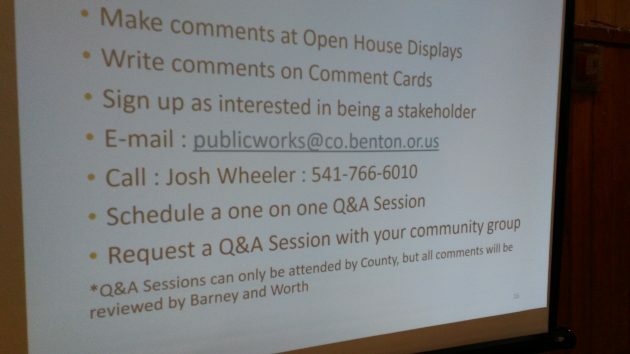 Benton County government in encourages citizen involvement. The Albany city council, on the other hand, seems to disregard citizen input, almost to the point where a successful vote in Albany may cause the council to foot drag and delay. The Benton County government encourages questions and public comment while the Linn County government is busy suing the State. The Benton County commission seems intent on looking forward, granting it’s citizens a stake in the future. Linn County government and Albany city government seem content to dwell is the past, a vice-like grip on power being most important. Benton County is a glass half full. Linn County and the City of Albany seem intent on maintaining the status quo. The differences are quite stark and predictive of behavior. Obviously you have not attended the multiple public meetings/hearings where public comment is definitely solicited. City Council meetings in Corvallis and in Albany are (by law) meetings held in public. However, while there is always a section for “Business form, the public” on the agenda, they are business meetings and are not by the public aka a “town hall” meeting. Direct & effective input to council members is & can be held by communicating with them individually and/or at the work sessions. Actual council meetings are not the venue to to that. A “public hearing” is designed for that process. 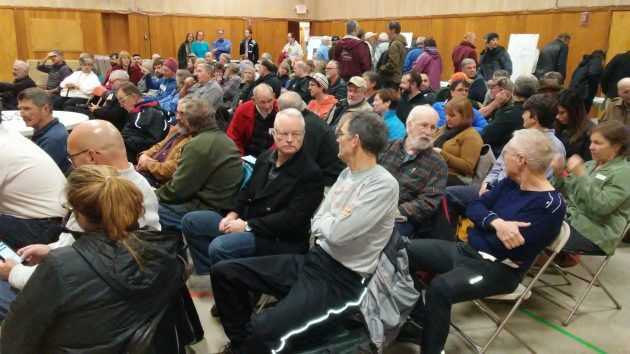 Many times we have asked for specific public input on many issues (as was done for the bike path meeting in the article) and guess what – virtually no one shows up other than staff. For myself it is hard to envision using any of these paths besides the one that parallels the railroad. The great mistake to be made here is assuming that the turnout at a public hearing is a representative sample of public opinion. I hope the commissioners will consider that there is a considerable group of persons who will never use nor will ever want this project to consume tax dollars. A public vote is the referendum which will tell the tale. Tony, if enough citizens constructively state opposition during this phase of consideration,, the project would likely not go forward. An opinion stated early can often forestall the need for a vote.